Chuckit Flying Squirrel nylon dog frisbee with rugged multi-layer construction. Flying Squirrel is made from rugged nylon. It has glow in the dark paws, durable rubber feet and raised sides for easy pick up. 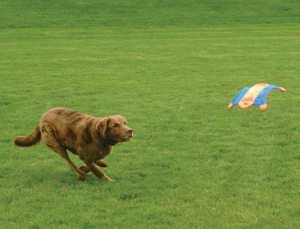 Probably the best dog frisbee on the market. It floats in water too. Its raised sides are an important feature, making it easy to pick up by the dog and the owner. 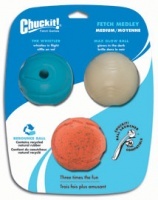 A great fetch toy that's light to carry and bright so you don't lose it on those darker evenings. These are a big hit with my destructodog Lister. He's a staffie mix and plays his own version of fetch - "seek and destroy". The erratic bouncing makes the seek part hilarious and so far, his best efforts, he's failed at destroy. Not even a scratch. Great toy. Really tough and lands on top of the long grass so is easy to find when puppy tires of bringing back. 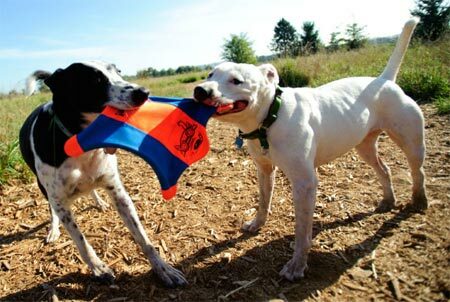 Well what can we say, this is brilliant, we have tested it to the max now, on one walk it withstood a bulldog, two German Shpeherds a lurcher and a very boisterous lab, they all had a corner each and tugged each other around for 40 minutes! 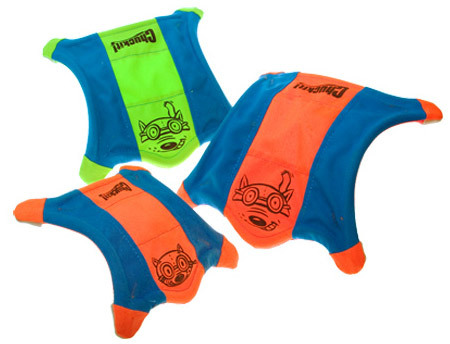 it lauches well when you throw it, and floats in water, brilliant toy we have started to use it in the dog agility lessons now as it is so sturdy. It folds up well aswell so I can just put it in a litttle bag when we go out. Having destroyed many toys I don't think our dog will rip this to shreds in a hurry! 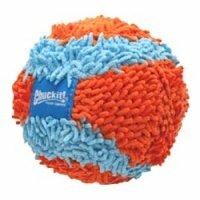 My Standard Poodle loves playing with this.He found a normal disc hard to pick up off the ground and this is easily retrieved.It is very strongly made and withstands a game of tug on return.It keeps its shape even after folding in a bag,it is light to carry whilst out for a walk and it is easy to throw.